XV2™ for Sale in Londonderry, NH | DONOVAN EQUIPMENT CO. INC.
Go where a straight blade can't with the FISHER® XV2™ V-plow. Featuring flared wings for snow rolling, use the plow in V position to break through snow piles or clear narrow lots or use in angle position to clean around curbs in Londonderry. Use the plow as a straight blade for even more versatility. 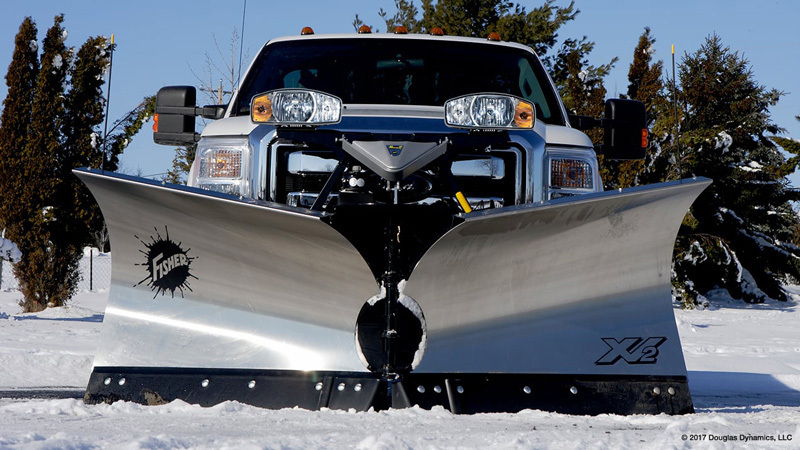 The XV2 v-plow is available in stainless steel or mild steel and fits most ¾ ton and 1 ton pickup trucks up to 5500 class. The XV2™ v-plow features extreme flared wings that soar from a 31" center height to 39" at the outer edge on 9' 6" models. The XV2 v-plow is available in premium corrosion-resistant stainless steel in in 7' 6", 8' 6" and 9' 6" widths, and in powder-coated steel in 8' 6" and 9' 6" widths. The blade comes standard with a high-carbon steel cutting edge, increasing wear resistance, and features a 70-degree attack angle for enhanced scraping and back dragging. The XV2™ v-plow features our exclusive x-bracing design which is constructed from four vertical ribs and eight x-bracing ribs. Both the ribs and boxed steel tube reinforce the blade for structural integrity and exceptional torsional strength. A 1¼" diameter heat-treated steel center pin resides within a three-connection point hinge, allowing you to hammer anything Mother Nature throws at you. Lift Cylinder 1¾" x 10" 1¾" x 10" 1¾" x 10" 1¾" x 10" 1¾" x 10"
1/2" x 6" (Optional) 3/8" x 6"
1/2" x 6" (Optional) 1/2" x 6" 1/2" x 6"